Will I be able to connect to the Internet on my cruise ship? Most cruise ships, with the exception of a handful of very basic expedition ships in off-the-beaten-track locales, provide Internet connectivity for things like checking email, posting to Facebook and checking in for your flight. The Internet is provided primarily by way of satellites, though some cruise ships have technology onboard that allows them to switch to land-based signal towers when sailing within a certain distance from land. Because satellite service can be spotty, cruise ships do not guarantee that you will have connectivity at all times. Is the Internet as fast on my cruise ship as it is on land? Generally speaking, no, the Internet you'll find at sea is not as fast as what you get at home. It can be painfully slow, in fact, depending on where you're sailing and on which ship. Cruise ships sailing in the Caribbean tend to have the fastest Internet at sea because that area of the world has the most satellite coverage. Certain parts of Europe, like the Mediterranean, similarly have a lot of satellite coverage. In those areas, you'll find you can check email, update Facebook, upload photos and do general Web searches without much difficulty. Additionally, newer ships typically have fast Internet because they were built with high-speed connectivity in mind. Most of the major cruise lines are rolling out technology to older ships to significantly speed up the Internet onboard, but it's a ship-by-ship process and could take several years to complete. If Internet connectivity is important to you, here are a few cruise ships that have been outfitted with technology that enables high-speed Internet: Royal Caribbean's Anthem of the Seas, Quantum of the Seas, Allure of the Seas and Oasis of the Seas; Carnival Cruise Line's Carnival Breeze, Carnival Freedom and Carnival Sunshine; Princess Cruises' Royal Princess and Regal Princess; and Norwegian Cruise Line's Norwegian Breakaway and Norwegian Getaway. Internet on riverboats, at least in the United States and Europe, is slightly different, as most boats are connecting to land-based signals. These tend to be of average speed but can be blocked by landmarks like shipping locks and high towers or landscape features like hills and mountains. With varying Internet speeds, will I still be able to stream movies or music or use programs like Skype and FaceTime? You cannot stream multimedia content or use Skype or FaceTime (or similar applications) on most cruise ships, as these types of applications require too much bandwidth. Only on ships that offer high-bandwidth packages -- like the Royal Caribbean ships listed above, as well as Carnival Breeze, Sunshine and Freedom -- will you be able to access these applications. Is Internet connectivity available everywhere on the ship? On most modern cruise ships, as well as new riverboats, Internet is available via Wi-Fi from front to back. That doesn't mean there won't be some areas on the ship where the signal is weak; usually the farther inside the ship you are, the weaker the signal. However, cruise lines are working on fixing this by installing technology throughout the ship to boost weak signals. 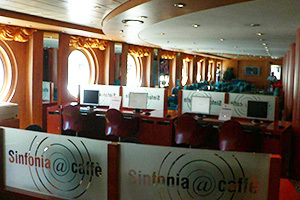 On older ships, as well as on some riverboats and expedition ships, Internet is only available in specified locations, such as a lounge or an Internet cafe. If you're booking an older ship or an expedition ship and you want the most coverage available, ask your travel agent or the cruise line if the ship has bow-to-stern Wi-Fi. Yes ... and no. Whether your ship's Internet is working at any given moment depends primarily on satellite availability. Are you far out to sea in stormy weather? If yes, you might not have any Internet. Are you in the middle of the Alaskan or Norwegian fjords? Again, probably no connectivity. Excepting these occasional circumstances, ships generally provide Internet connectivity 24/7. Do I need to bring my own laptop or tablet with me to connect? Almost all cruise ships and riverboats provide an Internet center of some sort (usually just a space off to the side of a hallway or lounge with a small number of computers), so you don't need to bring your own device with you. Because most public Internet lounges have limited space, you might find yourself waiting for an open terminal. Some might limit the amount of time you can be online. If you think you'll be spending lots of time online, plan to bring your own laptop or tablet. Can I connect to the Internet on my cell phone? Yes, you can use the Wi-Fi connectivity on your mobile phone to connect to your cruise ship's Internet. Make sure you're in airplane mode, though, or you might end up being charged for data by your phone carrier. If you're getting Internet on your phone and you didn't pay the cruise line for it, you're likely using data from your carrier -- usually at very expensive rates for at-sea service. How much will it cost to use the Internet onboard? Most cruise ships charge for Internet, though a rare few provide it for free, sometimes only to select passengers. Regent Seven Seas Cruises, for instance, gives those in Concierge-level suites or higher up to 500 free minutes of Internet per sailing, while Crystal Cruises provides members of its loyalty program up to 60 minutes of free Internet per day. Princess Cruises also offers select members of its loyalty program some free Internet time. River cruises typically include Internet in their pricing for all passengers. On most cruise ships, you have several choices for purchasing Internet service. The per-minute rate is the most expensive and can run anywhere from $0.50 to $0.99 per minute. Your best bet is to buy a package, which brings the per-minute pricing down. The larger the package, the cheaper the per-minute pricing. On some ships, packages are the only way to buy Internet. As an example of typical prices, Princess offers four time plans: 100 minutes for $69, 200 minutes for $99, 400 minutes for $159 and 600 minutes for $199. Royal Caribbean offers similar packages; on its ships with high-speed Internet, it's also experimenting with different pricing plans, including per day, per cruise and by bandwidth. Likewise, Carnival is experimenting with per-cruise and social-media-only pricing on its ships with high-speed Internet. Disney Cruise Line, unlike most other lines, only charges by bandwidth, with a $0.25-per-MB baseline and three packages (small, medium and large, ranging from $19 for 100 MB to $89 for 1,000 MB). Many cruise lines will offer a last-day special on a small package for people who want to check in to flights or make other travel arrangements. Cruise lines occasionally allow cruisers free access to social media (like on an inaugural sailing), but those promotions are few and far between, and they're rarely determined ahead of time. For cruise lines that charge by the megabyte (MB), what does that mean for me? To give you an idea of how much bandwidth you might need to purchase, here's a list of what you can do with 10 MB of data: spend 30 minutes on Facebook, Skype for four minutes, upload three photos or five minutes of video, listen to 20 minutes of music, send 33 emails with attachments, send 1,000 text-only emails or visit 30 websites. Is there a best time to use the onboard Wi-Fi? For the fastest Internet possible on your particular ship, try to use the Internet when others aren't. Early mornings and port days are good times, as are late nights. You'll find the slowest speeds during the day, especially when the ship is at sea. How can I keep track of how many minutes (or megabytes) I've used? Unless you have purchased an unlimited plan, you will need to make sure you log out of the Internet when you're done using it. When logging out or back in, the system will tell you how many minutes you've used and how many you have left. You can keep this tracker open in the background while on the Internet so you can keep tabs on your time at any given moment. Where can I keep my laptop, tablet, e-reader or cell phone safe onboard? On most ships, you can fit a tablet, e-reader or cell phone in your in-cabin safe when not using it -- though there might not be room for everyone to store all their electronics inside at once. If you've brought a laptop, it will not fit in the safe, so you'll need to leave it packed away in a suitcase or drawer if you don't want to leave it out in the open. How can I find out more about using the Internet on my cruise?